A slick and modern innovative design by Natuzzi, Forza is refreshing with clean lines and adjustable headrests.The 3 seater is a power recliner with power headrests and the 2 seater is static with manually adjustable headrests. The leather is the highest category in the Italian protecta range cat 20 thick soft feel. 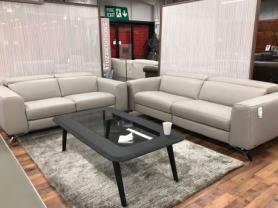 Extremely modern sofas that will enhance the look of any room.Brand new cancelled order ready for immediate delivery. This item is covered by our own 12 months warranty against manufacturing defects, failure of materials. This warranty does not cover accidental damage to the item or damage caused by abuse or unreasonable use of the item. You must allow our representatives to examine the item if you feel you have a warranty claim and give the company the opportunity to repair any defects. Your item should arrive to you free of damage and in superb condition. Our customers' happiness is paramount to our business ethos. Your item should arrive in your home in superb and acceptable condition if we have arranged the delivery. If The customer or customers own representative have collected the item we can only assure acceptable condition at the time of collection from our premises. Customers or customers representatives collecting must examine the item at the time of collection to ensure acceptable condition, after this point we cannot accept any claims for damage as this may have been caused outside our control. If in the unlikely event your item is not repairable and responsibility for the defect is covered under warranty we will offer a refund which may contain a reduction for dilapidation (benefit of use to the customer based on time) at a rate of 4% of the total value of the item excluding delivery per month from the time of delivery. This calculation is based on advice given to us by trading standards. If an item is supplied new to replace a defective one, warranty on The replacement item is only valid to the end of the warranty period for the originally supplied item. For example if the sofa is supplied and after six months replaced the replacement sofa will have six months warranty remaining as per the original item. After a period of 12 months if your item developed a fault we will not be able to fix your item at our expense, however we are always happy to help and advise our customer as to the most cost-effective repair and recommend a suitable agent where possible. We never charge a premium for this and will always try to help you get it fixed at a trade rate i.e. what it would cost us. If you require a longer than 12 months warranty on this item please ask an advisor and we may be able to negotiate this at extra cost.